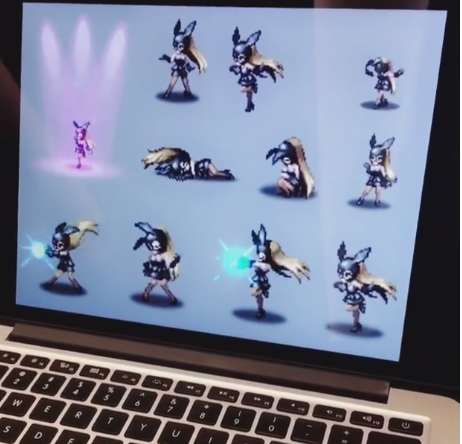 Brave Frontier studio Gumi developed Brave Exvius. No, I don't know why the Japanese government hasn't stepped in to stop Square from naming things. lol it's as if Square's marketing department is directed by a random word generator bot, haha. Players will be able to move their characters through fields and dungeons to search for items, hidden paths, and new routes. Final Fantasy: Brave Exvius will release in North America and Europe in summer 2016 for Android and iPhone. Pre-registrations are currently open. Saw the trailer. This seems to be like Record Keeper, only that it takes in a world, and not inside a castle with paintings recreating specific moments of the FINAL FANTASY mainline history. Both protagonist are named Rain and Lasswell. Interesting pick. Love both of their designs. Scratch that, there are three protagonists. Third one's a female named Fina. She seems to be a bow & arrow trained White Mage. Dungeon and world design look great. Apparently, you can have a party of up to six members in it. Party members can be both heroes and villains from the entire FF franchise. I don't think I've seen unique enemies, but I remember seeing a couple of enemies from previous FF titles. After watching the entire trailer, I must say that the presentation was excellent. And no wonder the pre-registration site wasn't working. It was supposed to go live yesterday, haha. Already pre-registered, by the way. they seem to have a system similar to kickstarter's where you can contribute points by liking the game on Facebook; following it on Twitter; sharing the game on Facebook; tweeting about it on Twitter; and send emails to friends. Depending on the "Milestones" they reach, the players will get these rewards. According to this site, Brave Exvius will be localized withsix languages (English, German, French, Spanish, Chinese (traditional) and Korean), and will have a playable demo at e3. Rain and Whatshisname are actually Visions that the mysterious girl is using to help fix Grandshelt from the future. Just started playing the game. Kinda hella low key annoyed I have to be constantly connected to my internet to play the game, but the game itself is pretty nice. Pretty much a standard FF mixed with Record Keeper, which I like. Unlike Record Keeper, however, there's an actual plot that keeps me wanting to continue the game. Now I just gotta wait on SE to release the FF game over here that made straight boys uncomfortable. I'm actually enjoying myself. Out of the 10 free rare summons they gave, I got 2 4* (Celes and Exdeath), so things are going swell for me. Anybody want to be pals? ^Agreed. Its way better than record keeper because it has a story and exploration. I wonder when they're going to add characters from final fantasy VII and X. So far I've only seen characters from IV, V, VI and XII. I hadn't noticed that yet, but i haven't seen anything to challenge that outside of characters from I. Also, anybody think we should save our lapis for future deals? Actually I've seen Vivi and Zadane in the game so characters from 9 are also in it. Or at least they were in the Japanese version. Not sure if Vivi and Zadane are in the NA version or not. Or at least yet OH! I also saw FF2 characters as well. And I think I may have seen a Onion Knight from FF3 as well...I remember seeing Ferion from FF2. Yeah, you're right. I was just playing some more and I saw Vivi, Zidane and Kuja from 9. I also saw Shantotto from 11. I havent seen the Onion Knight or Firion but I'll take your word on it. So just 7, 10, 13, and 14 dont have any characters yet. I remember when this was announced and now, believe it or not, I'm seeing ads for it. I'm glad this game has unique characters like Final Fantasy Dimensions. It's nice to have the entire FF cast back too. I guess we should call it the welcoming committee. Also...the most unusual name goes to....Fina? They have the freaking Dwarf King from FF4 lol. But yeah, I am getting this now my friend just showed me that he had a bunch of my faves, Rydia and Krile, lol. But yeah, I like the art so we shall see. Petition for the subtitle of thread to be the Adventures of Welly and Rainikins.